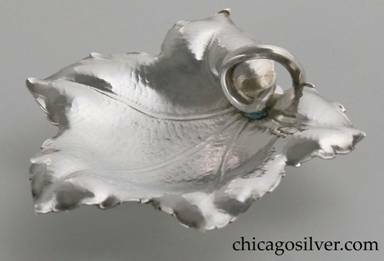 Many of the best American Arts & Crafts silversmiths came from Scandinavia, and the influence of these Northern European artisans on the movement was profound. At the Kalo Shop, chief designer Yngve Olsson was Danish and mainstay Daniel Pedersen was Norwegian. Julius Randahl, who worked at the Kalo Shop and later started his own business, was Swedish. 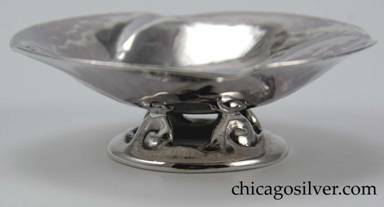 Many Chicago silver designs were in "the Danish taste" and the Kalo Shop even tried producing a Scandinavian-inspired group of items it called the Norse Line. Knut Gustafson, who worked with Randahl, Jarvie, Lebolt, and the TC Shop was Swedish, and named one of his patterns "Nordic." John C. Petterson, who made many of Jarvie's celebrated candlesticks and later formed The Petterson Studio, was Norwegian. Talented Scandinavian craftsmen moved to Chicago in large numbers at the turn of the century, spurred on by silversmith guilds in their native countries "so fearful of having a surplus of trained people that they even secured funds to help the most promising young apprentices emigrate to America," according to Kalo's Robert Bower [Darling, p. 91]. One of the very best Scandinavian masters settled in New York rather than Chicago. Peer Smed (born Peer Schmidt) was born in 1878 in Copenhagen, the son of a blacksmith. He became an expert metalcrafter and produced objects somewhat in the Jensen style but with characteristic touches that clearly marked them as his. Smed designed household pieces for the royal families of Denmark and Sweden, who awarded him medals for artistry. When he was 25, Smed visited America for four years. 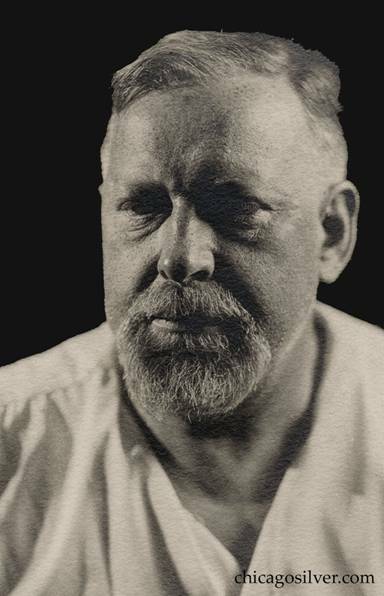 In 1909, after returning briefly to Denmark, he moved permanently to Brooklyn, NY where he started his own art studio at 176 Johnson Street. 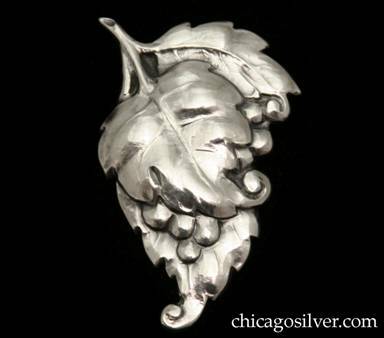 Smed worked there for the rest of his life, creating handmade objects in a variety of different metals. His obituary spoke of his honors "as a gold carver, a silversmith and as a designer of iron grilles." He was also proficient in copper and bronze. During his lifetime, he exhibited his work at the Brooklyn Museum of Art, the Metropolitan Museum of Art, and galleries in New York and San Francisco. Smed produced the elaborate bronze doors designed by William Zorach for the entrance to the Schwarzenbach Building in New York City, and created silver designs for Tiffany and Company. 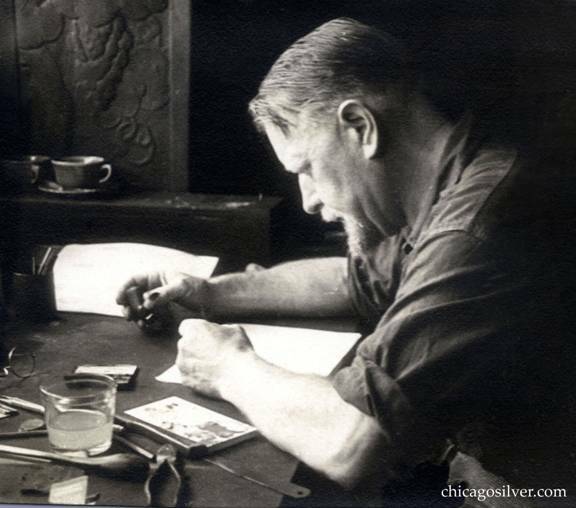 He fashioned decorative iron work for several New York restaurants, as well as designs for the homes of Lucius M. Boomer, former managing director of the Waldorf-Astoria Hotel, and William Knudsen, CEO of General Motors. 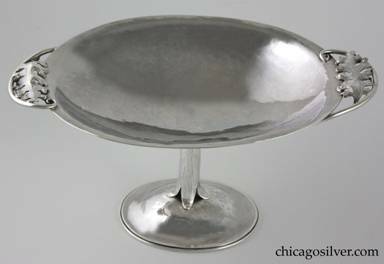 In conjunction with the well-known designer William Stark, he created the flatware and holloware for the Waldorf-Astoria Hotel in 1932. His work is currently held in the Brooklyn Museum of Art, the Metropolitan Museum of Art, the Dallas Museum of Art, and the Art Institute of Chicago as well as several private galleries and collections around the country. 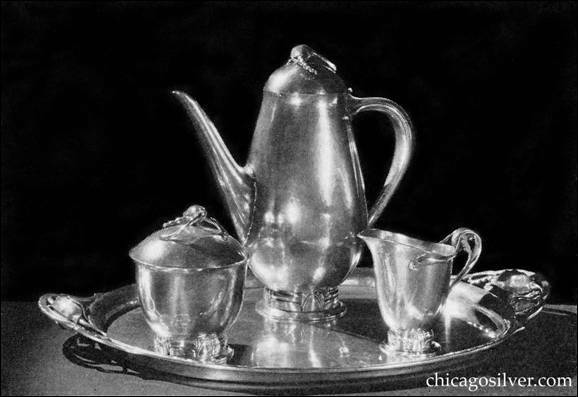 A 1937 Brooklyn Museum of Art contemporary industrial and handwrought silver exhibition highlighted Smed's work and featured a step-by-step photograph illustrating how he fabricated his distinctive flatware in its catalog. The Smed coffee service and basket below were showcased in this exhibition. 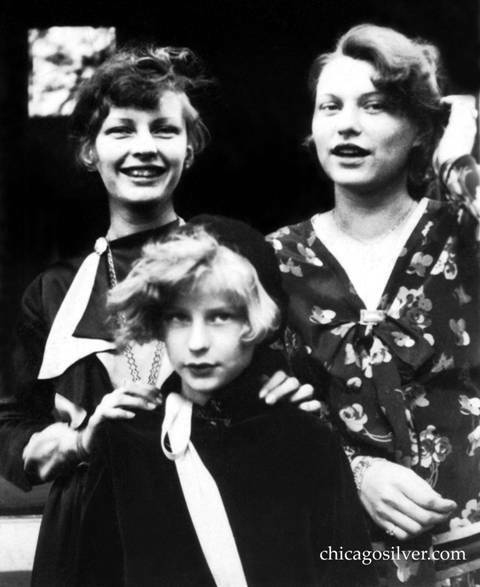 He and his wife Helga Kjior or Kior (1876-1964) also of Copenhagen, had five children: Lona Schaeffer (b. 1903), Dan Smed (1907-1951), Alice Smed (1910-1928), Ellen Oberg (1911-1971), and Elsie Lowry (1917-1997). 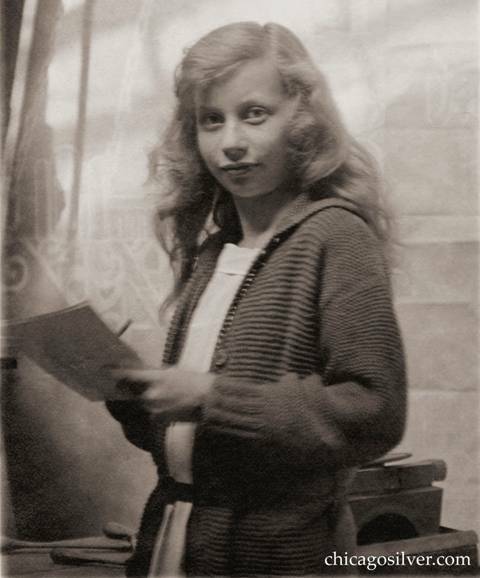 Alice died at the age of 18. Smed with daughter Lona in the workshop. Notice the plaque on the wall behind her (see below). 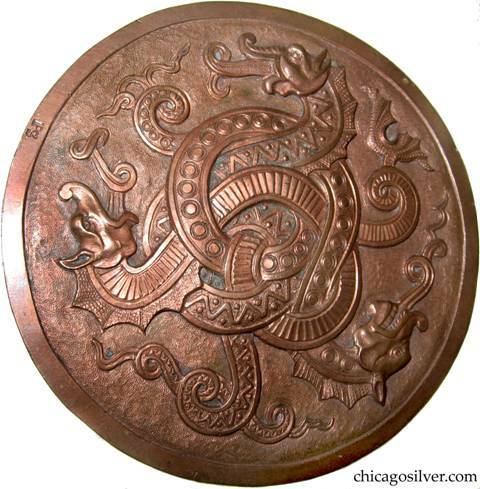 Smed worked in a wide range of metals, from copper to silver to iron to bronze. 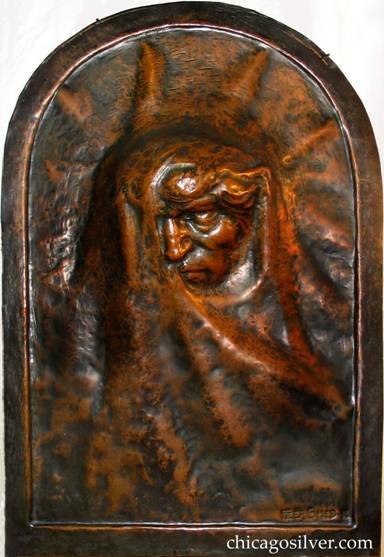 Large (16" W and 23" H and 3" deep) copper plaque entitled “Conscience” by Peer Smed. According to the family, his wife Helga posed for the portrait. See similar object on wall in photo above. 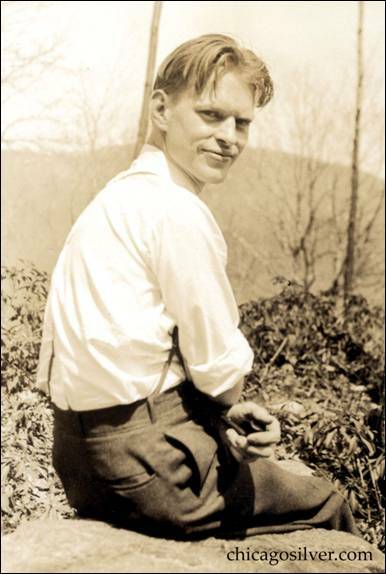 Dan was working with his father in 1934 when he married Alice, a woman he had met at the Art Students' League in New York City. 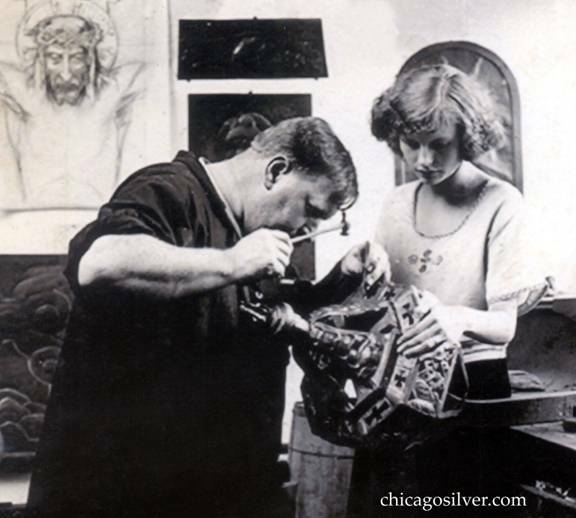 As there was not enough work to support two families, Dan accepted an offer from Edward H. Bohlin, "Saddlemaker to the Stars," to do silversmithing and engraving, and in 1939 moved to Hollywood. At the start of WW II, Dan left Bohlin's and became a welder at the Todd Shipyard in San Pedro, California. 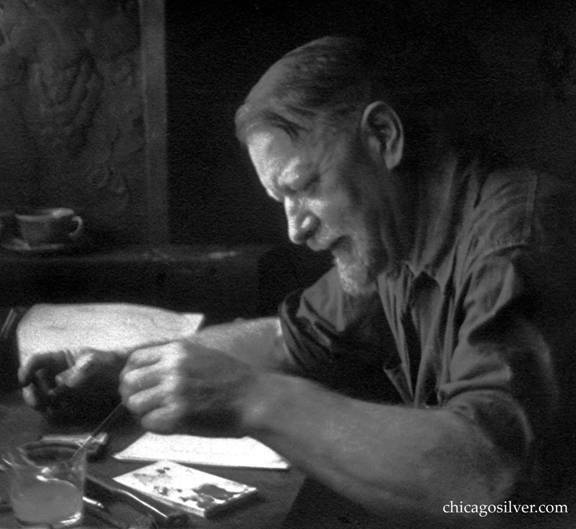 After the war ended, he returned to jewelry-making for Alan Adler and Trabert & Hoeffer in Hollywood. In early 1950, he opened his own shop on North Canon Drive in Beverly Hills, making jewelry for wealthy clients. 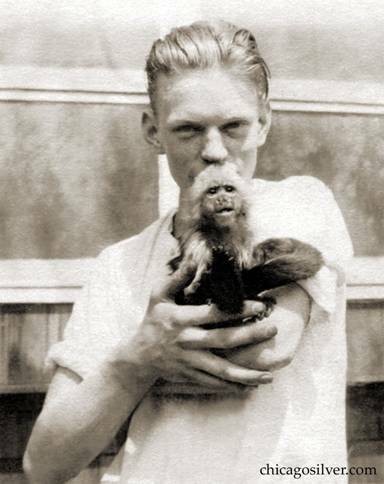 Unfortunately, a little over a year later, in March 1951, he died of congestive heart failure before he could build up his reputation for skilled and artfully created fine jewelry. Dan's daughter remembers that her father often worked on pieces in his home shop. One in particular was a grosgrain ribbon made entirely of delicate strands of platinum for 40s Marion Davies, actress and mistress to William Randolph Hearst. The ribbon was said to be so finely worked that it moved like fabric. 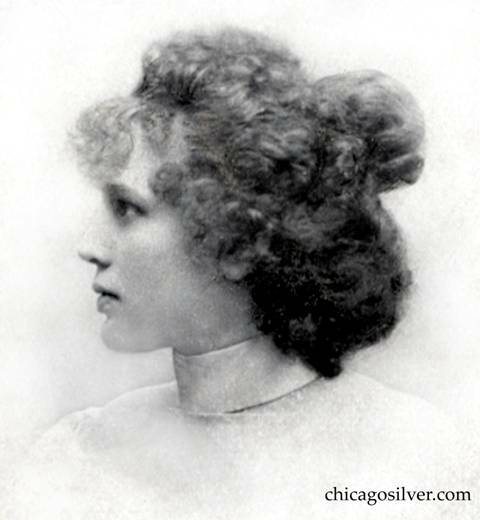 Dan had brought it home to add a large, beautiful diamond Miss Davies had chosen as a fastener where the two ribbon ends crossed at the throat. Smed's son Dan also produced fine metalwork. 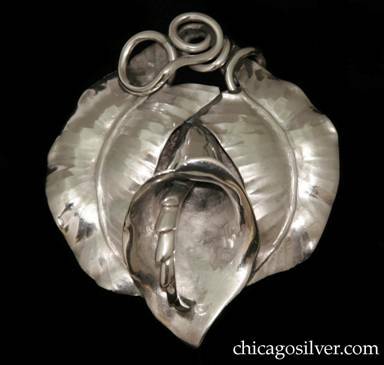 Most of his pieces are privately held. 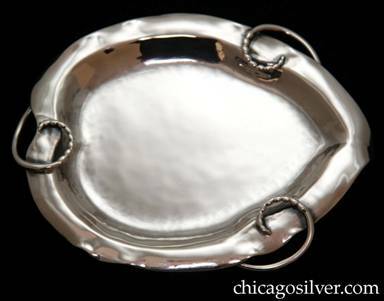 Peer Smed's silver is gaining in popularity. 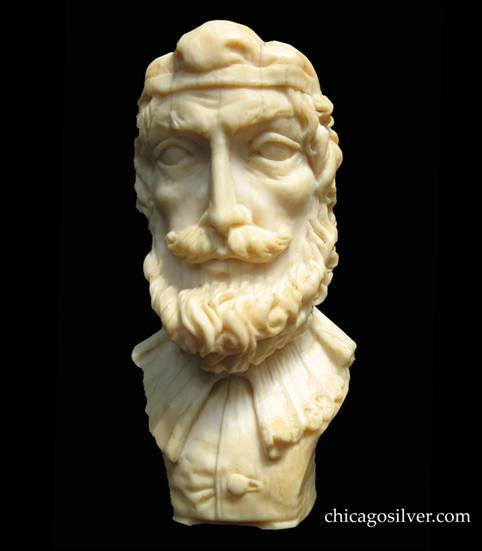 At a 2007 Sotheby's sale, several substantial objects brought record prices. A 1935 four-piece coffee set (teapot, coffee pot, creamer and covered sugar) on a remarkable 26" tray with large jack-in-the-pulpit blossoms incorporated into the handles sold for $18,000. A 1935 asymmetrical baluster-form covered pitcher "supported on lobed foot and short openwork stem chased as leaves, berries and vines, the loop handle wrapped with beaded tendrils and capped with leaves and tendril" went for over $10,000. A 1935 tazza, "with flared undulating rim, supported by stem formed as erect leaves and beaded tendrils and capped by openwork clusters of small overlapping leaves, all on partially octagonal stepped domed circular foot" brought more than $11,000. 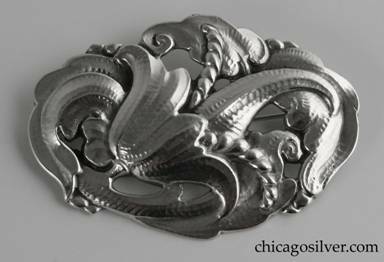 Smed used heavy-gauge silver, and made frequent use of floral motifs, notably lilies and jack-in-the-pulpit blossoms, in high relief and lifelike dimensional form. 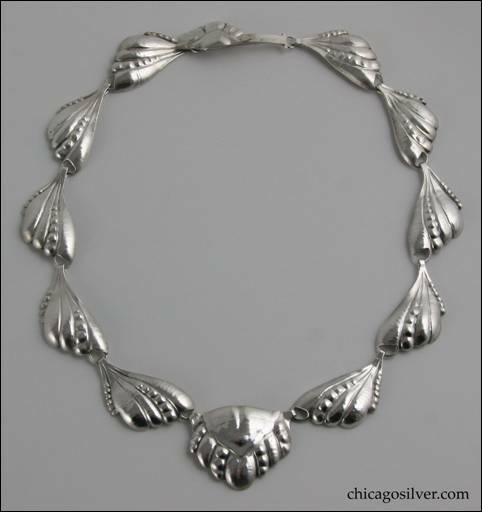 He began adding stamped dates to many of his better works in the 1930s, a period when silver purchases began to decline in the belt-tightening years of the Depression. 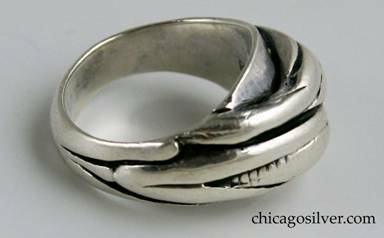 Smed made both handwrought jewelry, where he crafted entire pieces by hand, and hand-chased objects like the ones above that he first cast, and then worked extensively by hand. Smed at work. His pieces ranged from small pins and brooches to large, impressive plaques and doors. 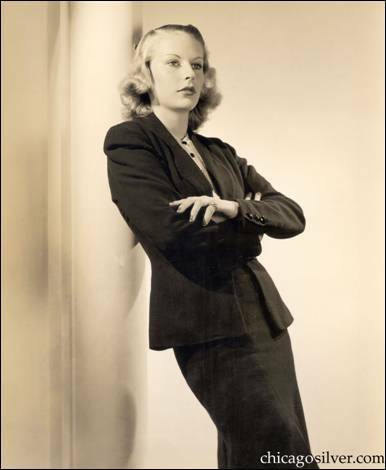 Elsie Smed Lowry, Smed's youngest daughter, in a modeling shot. 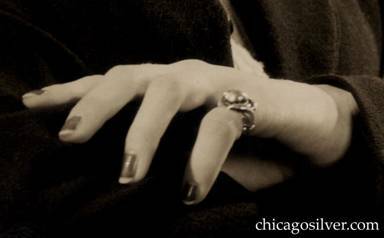 The ring is by her father (see closeup below). 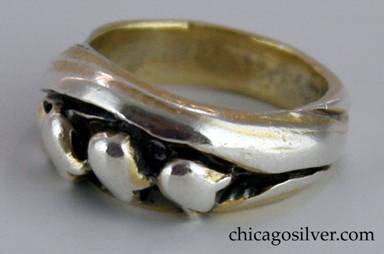 Most of the jewelry we've seen is in the form of smaller pieces such as rings and pins. However, the Smed necklaces below are larger scale. And his trademark jack-in-the-pulpit pins ranged from 2-1/2 inches to massive and heavy versions almost twice that size. a large pointed oval plaque with chased fuchsia blossoms and leaves. Some of Smed's smaller pieces, like the salt set below, resemble his jewelry. Individual leaf-form footed salts and shovel-form salt spoons. Work by Smed's daughter Lona is sometimes hard to distinguish from that of her father without turning it over to look for her LPS mark. 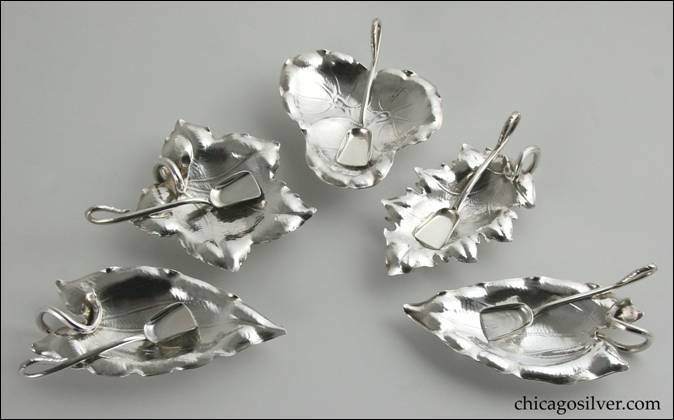 To see a Smed salad set with similar ornament to the one by Schaeffer above, click here. 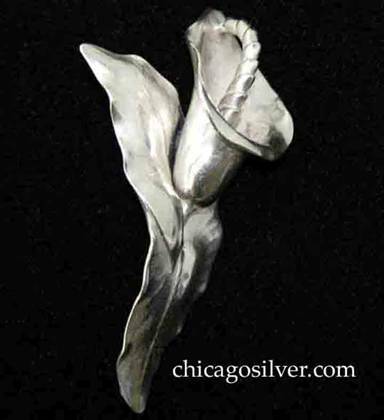 Brooch / pin, in the shape of a lifelike 3-dimensional lily with detailed beaded stamen and chased leaves. Heavy. Second example of brooch / pin, in the shape of a lifelike 3-dimensional lily with detailed beaded stamen and chased leaves, but slightly larger than one above and with rounder stamen. Heavy. 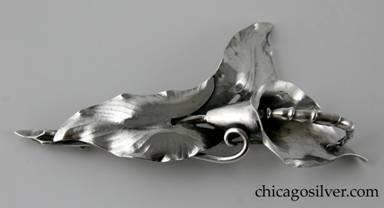 Brooch / pin, very large, in the form of a detailed lily, with long curving stamen and two large pointed leaves. Very dimensional, and well-made. Beautifully hammered. 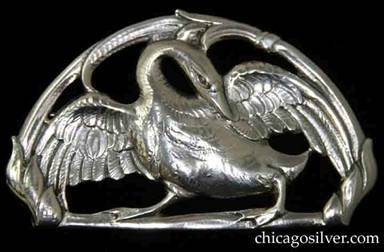 Brooch / pin, oval with flat bottom, large and heavy, in the shape of a swan with outstretched wings on a cutout frame with floral decoration. Nicely detailed chasing. 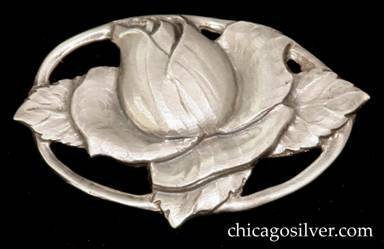 Brooch, handwrought in sterling silver with rose blossom design and beautifully chased details. 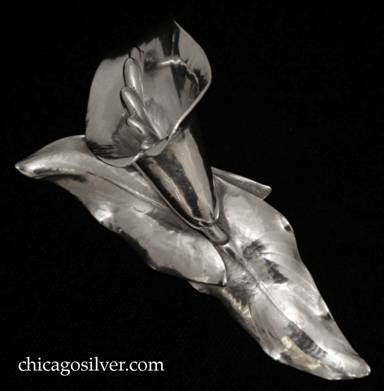 Brooch, handwrought in sterling silver with three fuchsia blossoms atop a leaf. Beautifully chased details. Very heavy. 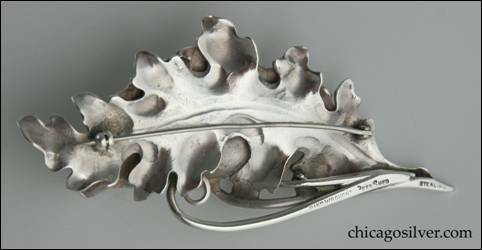 Brooch, handwrought in sterling silver in the form of a morning glory overlapping leaves on an oval cutout frame. Beautifully chased details. 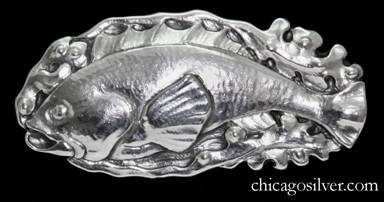 Brooch / pin, in the form of a lifelike and finely-worked fish on an oval background with freeform waves at the edges. Heavy. 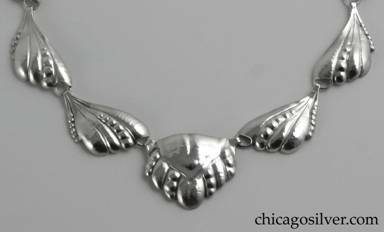 Clip, dress, in the form of detailed dimensional leaves, stems, and berries, with a spring clip on the back. 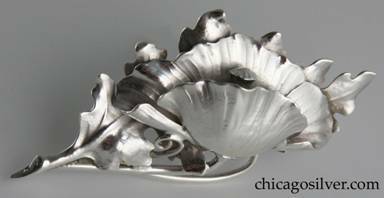 Brooch / pin, in the shape of a cornucopia, with chased details and curving ornament at each end. 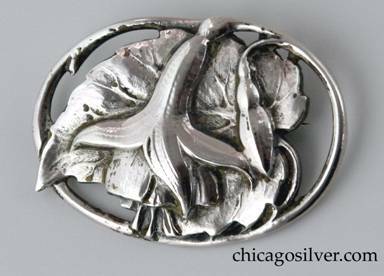 Brooch / pin, in the shape of a lily with detailed stamen and leaves. Brooch / pin, in the shape of a lily with detailed stamen and leaves. Solid and very heavy for its size. 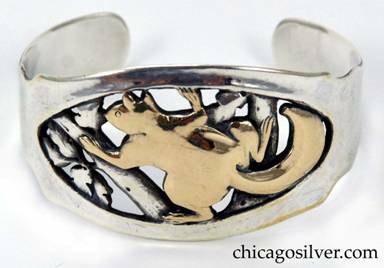 Bracelet, cuff, with open back, and wide central element with chased, pierced, and repoussé lifelike squirrel in tree with branches and leaves. Squirrel is covered in 14K gold. 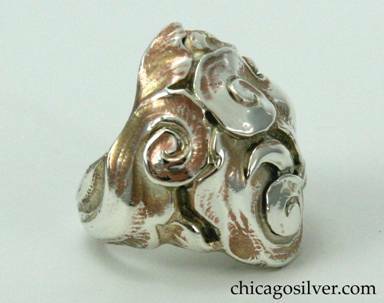 Ring, massive, composed of large hand-worked freeform silver swirls and spirals. Very heavy. Earlier gilding is worn. 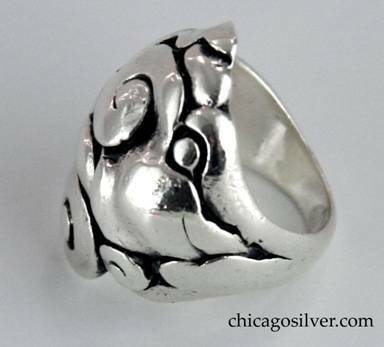 Ring, massive, composed of large hand-worked freeform silver swirls and spirals. Heavy. 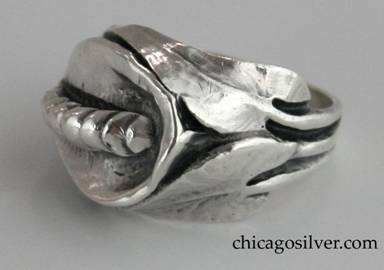 Ring, heavy for its size, with a jack-in-the-pulpit blossom on the front and arrow-shaped leaves curving around on the sides. 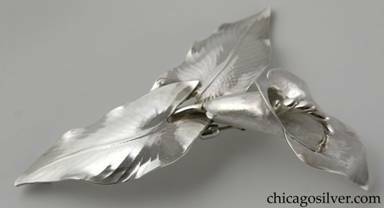 Brooch / pin, in the shape of three flower blossoms with gilded seed pods emerging from silver flowers, two of which are on curving stems with a background of tall thin leaves. 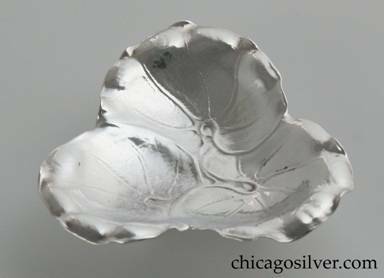 Brooch / pin, on open oval frame, with chased blossom and seed pod atop large detailed leaf whose pointed end extends slightly past the edge of the frame. 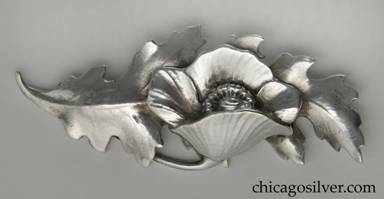 Brooch / pin, with chased and cutout design of applied poppy blossom atop a long serrated leaf. Slightly dimensional. 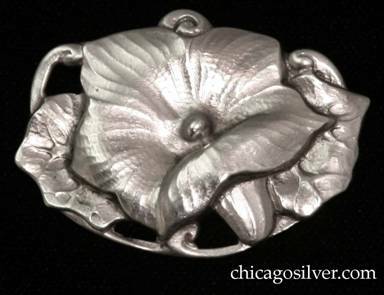 Brooch / pin, oval, with chased and cutout design of flower blossom with large curved protruding stamens surrounded by stylized leaves. Convex, heavy, and slightly dimensional. Extensively hand-worked. 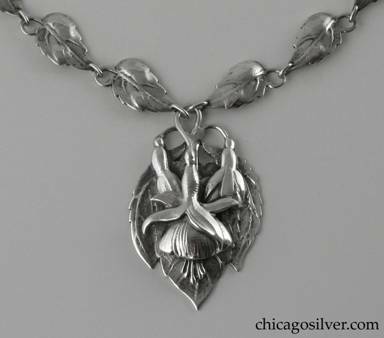 Necklace, silver, composed of 16 leaf-form links each with a stem that curves around and forms a loop, centering a large pointed oval plaque with chased fuchsia blossoms and leaves. Plaque is heavy and dimensional. 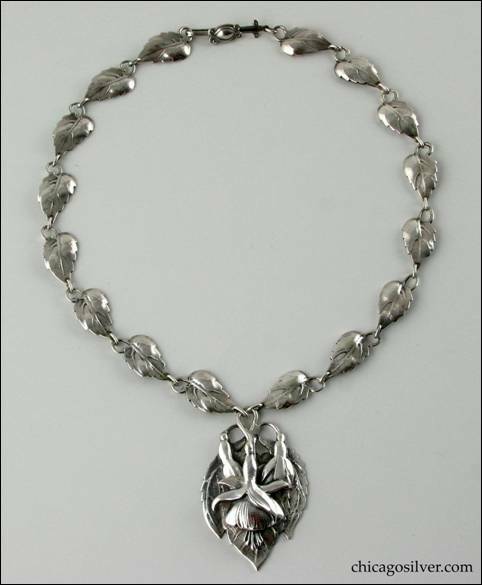 Long thin interesting clasp with applied curving decoration. Dish, small, leaf-shaped, with rounded raised slightly irregular edge and three beaded tendrils curving up over the edge from the back. Hammered surfaces. Heavy. 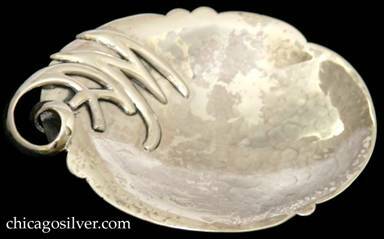 Dish, small, round, with rounded raised slightly irregular edge and three beaded tendrils curving up over the edge from the back. Hammered surfaces. Heavy. Bowl or compote, footed, with handles. 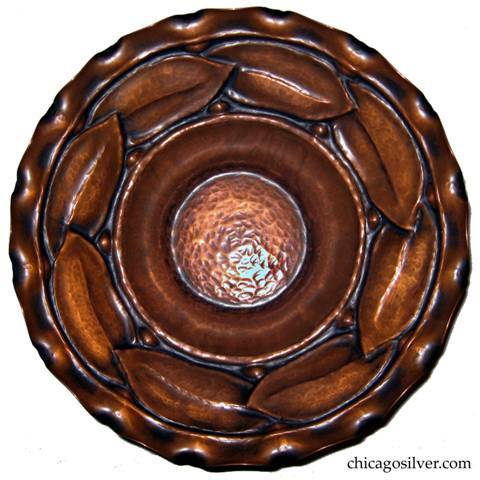 Oval form with small flat raised edge and two handles made of curving wires each spiraling at the end and centering an applied repousse oak leaf. 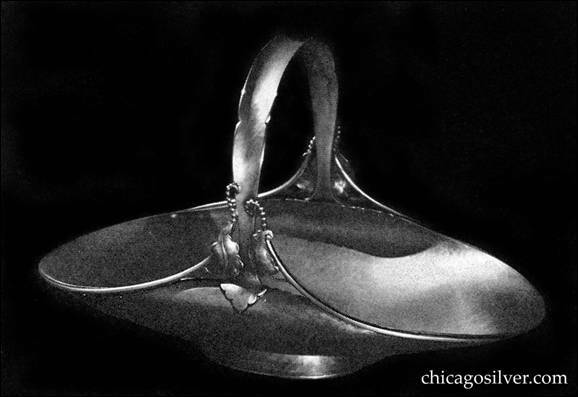 Small oval foot with stepped edge. Stem is made of hollow silver tube with four spreading pointed extensions at each end. Hammered surfaces. Salts, set of four (4), round bowls with four evenly-spaced repoussé swirling decorations at the edge, on small spreading cutout feet that repeat the swirling form. 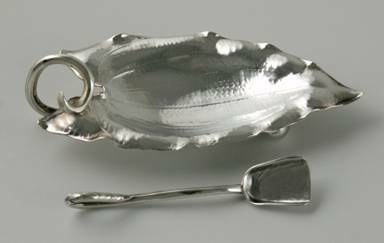 Salts, set of five (5), leaf-form, with eight (8) spoons. Four have two ball feet and a thick coiled stem that also acts as a foot. One has three ball feet. Each is heavily hand-worked. One leaf (with three ball feet) has three round lily-pad-type lobes. One resembles a maple leaf. One resembles an oak leaf. Two almost identical ones have a curved arrowhead-type form. Beautifully hammered detailing. The eight spoons are in the form of small square-point spades with flat fronts and raised edges at the sides and back, and have curving ends. Knife, with heavy solid handle and wide hammered curving blade with freeform scalloped edges. Fine applied blossom and curving leaves at end of handle. Heavy. Made by Smed's daughter Lona P. Schaeffer. 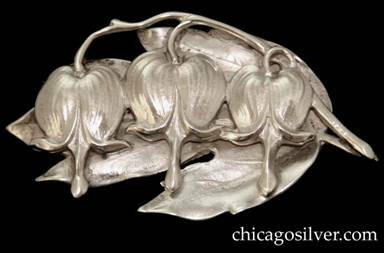 Pin in the form of a jack-in-the-pulpit blossom with a curving chased leaf on each side and thick curving wirework stems at the top. Large heart-shaped silver disk at back to support pin. Massive and heavy. Made by Smed's daughter Lona P. Schaeffer. 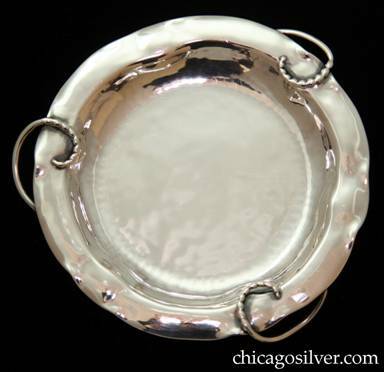 Small dish, concave oval form with shaped rim on low oval ring foot and a stylized strap handle with looping scroll on one side formed by the point of the letter "A" in a curving, applied AM monogram. Made by Smed's daughter Lona P. Schaeffer.